At first glance, you might think it’s a pumpkin or a sweet potato pie. 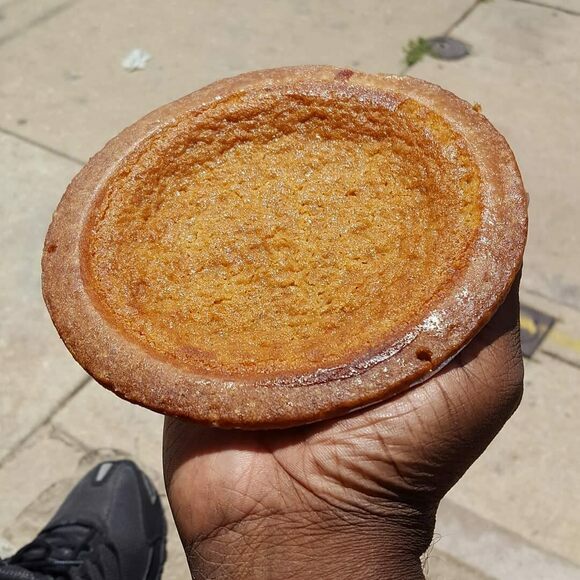 Yet bean pies, a unique specialty in some African-American Muslim communities, are made with creamy navy beans, spices, and a whole-wheat crust. The sweet pies, sold for fundraising and at bakeries across the United States, can be traced to the writings of the Nation of Islam leader Elijah Muhammad, who in two books laid out guidelines for a healthful diet, excluding pork and sweet potatoes. In a short documentary on bean pie, historian Zaheer Ali notes that the strictures against certain foods were also meant to reject those associated with slavery, sweet potatoes among them. So the bean pie became a tasty alternative. Some say the original bean pie was invented by Elijah Muhammad’s daughter, while others maintain it was the creation of Lana Shabazz, Muhammad Ali’s cook. Bean pies come in full family sizes, but also in single servings, tightly wrapped in plastic. Though not as common as it used to be, in some cities, Nation of Islam members still sell pies at intersections out of bright pink boxes. Individual bean pies tend to sell for $2 to $4, while larger ones are typically $10 and up. This bakery is one of the last in New York to carry bean pie. Raoof's sells navy bean Friday at the San Pedro Square farmer's market, and every Sunday at the Evergreen farmer's market.